Product renders and marketing shots are one thing. It's another thing entirely to look at a consumer electronics product in the flesh. So let's look at the new Nintendo Wii and Wii Remote colours! 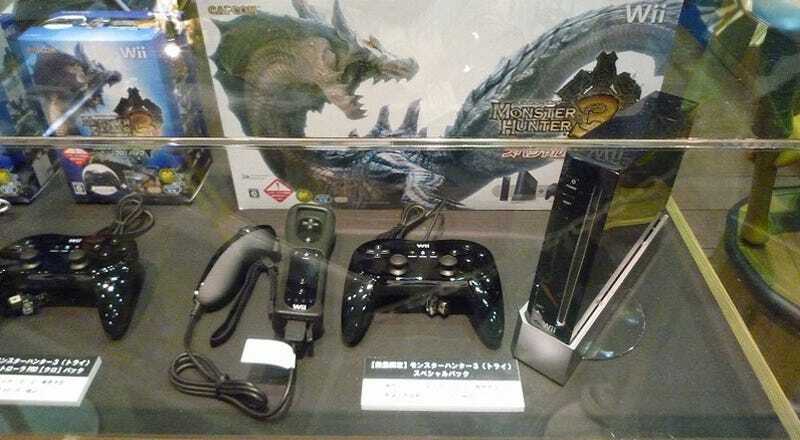 Both the black Wii (and its associated peripherals) and the blue Wii Remote (currently a Japan-only Club Nintendo contest prize) were present at the World Hobby Fair held in Tokyo over the weekend. The blue Wii Remote & nunchuk look about as we'd expected. Blue. Very blue. But the black Wii looks like it really shines, the console's gloss finish a lot more apparent in black than it was in white. Digging the two-tone nunchuk.